Bimba Manufacturing is a forward-thinking innovator of actuation technology, specializing in providing cutting-edge solutions to engineering challenges. Since introducing the round line, stainless steel body cylinder nearly five decades ago, Bimba has expanded its capabilities to include an extensive line of electric actuators and motion control solutions. 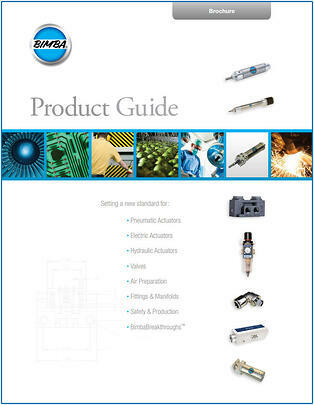 Round Line: Electric Actuators that provide precision positioning with programmable control. Guided Thruster: For use in non-rotating applications where side or moment loading may be present. Rodless: Precise position control for applications requiring high load carrying capabilities. Bimba Stepper Motors are available for diverse applications with or without a Bimba electric Actuator. AC & DC Stepper Motors: NEMA 23 and NEMA 34 High Torque AC & DC Stepper Motors are available for use with our electric actuators. AC & DC Servo Motors: NEMA 23, NEMA 34, 40mm, 60mm and 80mm frame size High Torque AC & DC Servo Motors. Drives & Controls: Intelligent AC & DC digital stepper motor drive/controllers are compatible with all Bimba DC motors.